This tee section fits 7 inch diameter pipe, creating a linking point for other pipe in the Heat-Fab Saf-T line of chimney lining products. As with all Saf-T pipes, this section is solidly built, featuring 316-alloy stainless steel materials and a take-off section that is easily removable to provide flexible connection possibilities. 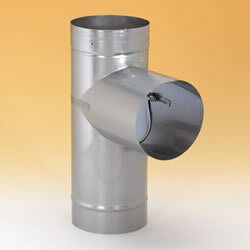 Constructed with convenience in assembly and long term efficient use in mind, a Saf-T chimney liner will give you the best possible venting results.